Geek Grotto - Get Your Geek On! 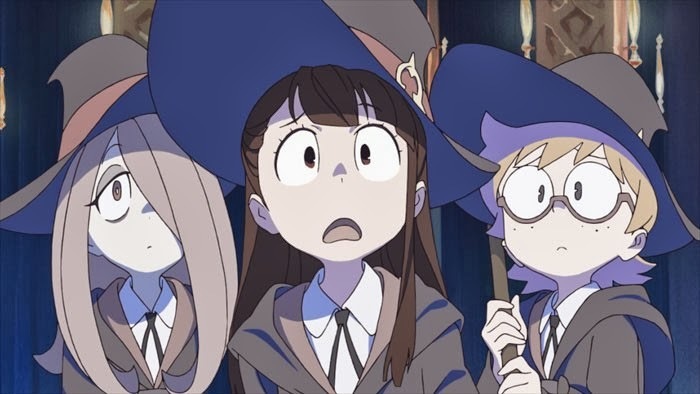 : Little Witch Academia Blu-Ray Collectors Edition Now Available! Little Witch Academia Blu-Ray Collectors Edition Now Available! Trigger's gem, Little Witch Academia, is now available as a Blu-Ray Collectors Edition containing a 112 page art book, art book translation (?) and the 66 minute making of featurette. This can ONLY be purchased from Trigger's online shop, which is based in Japan. On the plus side, the site is in English, so purchasing by a non Japanese speaker can be done easily:). So prepare to part with your 6000 yen, or around $60.50. THE COLLECTOR’S EDITION OF LITTLE WITCH ACADEMIA IS NOW AVAILABLE ON TRIGGER’S GLOBAL ONLINE STORE! LOS ANGELES, CA., November 11,2013 -acttilis excited to announce, on behalf of the animation studio TRIGGER, that the highly anticipated Collectible Edition of Little Witch Academia is now available for fans worldwide to purchase from TRIGGER’s Global Online Store! Purchased items will be shipped directly from Japan. The Collector’s Edition will come with 1 Blu-ray disc that includes the 26-minute episode of Little Witch Academiaand the never-before-seen 66-minute making-of video “How the Magic was Born.” This release will also come with an original soundtrack disc and an incredible 112-page art book. The inspirational making-of video follows the struggles and breakthroughs of the young animation team at TRIGGER, and the meticulous process they went through to create this anime. Not only will fans of Little Witch Academiaenjoy the making-of video, but anyone pursuing a career in the animation field will find something to take to heart. Get a sneak peek at the making-of video “How the Magic was Born” at www.littlewitchacademia.com!